The fourth painting, the physical world and human figure. The fourth in this series of paintings brings some sense of the connection between the outer physical and inner worlds. There are two main features depicted here. One is the alignment of the physical world with a human figure, and the second expands on the details given in the first picture of the various inhabitants of the world, by here listing the length of their lifetimes. Some of this is based on the 10th verse of the first chapter of the Kālacakra Tantra, and in its commentary to that verse, the Vimalaprabhā states the famous phrase "As it is without, so it is in the body" (Newman's translation, ji ltar phyi rol de bzhin lus). It is described that just as the height and width of the world system are both 400,000 yojanas, so the height and width (with the arms outstretched) of the human body is four cubits (khru). (This is somewhat reminiscent of the famous Vitruvian Man drawing by Da Vinci. He also considered, according to the Encyclopaedia Britannica, "...the workings of the human body to be an analogy for the workings of the universe.") 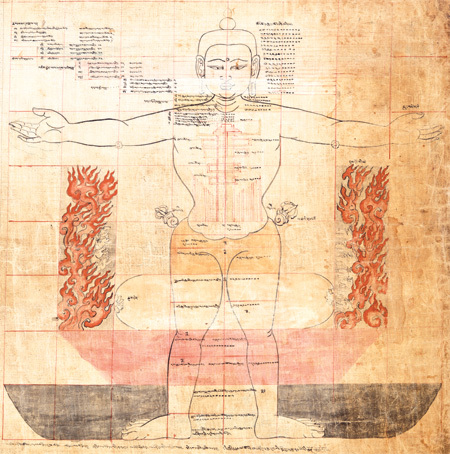 The language used in the tantra and other Kālacakra literature speaks of the head, neck and so forth of Meru. For example, the positions of the four type of gods of the formless realm are given as extending from the top of the uṣṇīṣa of Meru to the hair-line; the position of the four types of (form) gods associated with the element of wind is the forehead of Meru; the four of fire the nose; those of water down to the chin; those of earth, two thirds of the neck. The gods of the desire realm are in the lower third of the neck and down to about the midpoint of Mt. Meru (descriptions vary). Meru itself is considered equivalent to the spine of the human body. The sites of the other classes of beings – humans, asuras, and so forth, down to the lowest hells – are not normally described as being in, for example, the legs of Mt. Meru, but simply on the surface of the earth or in the elemental disks. 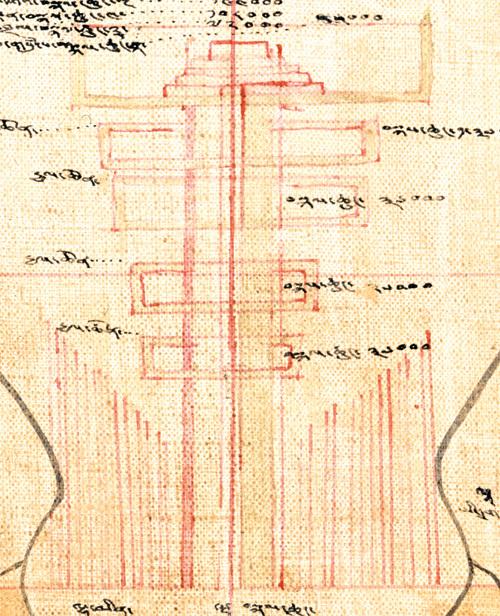 The description aligning the body with Meru starts from the waist – deemed the bottom of the spine – and goes upwards. The main information that is contained in the writing that can be seen stretching from the top of the painting to the very bottom consists of a repeat of the names of the various types of existence, together with their expected lengths of life. Unfortunately, not all of the writing on this painting is legible, and there also seem to be some inconsistencies in the numbers given. The lengths of life of the various types of existence are usally given in terms of numbers of eons (bskal pa). There are four types of eons, each of different lengths. In decreasing length, these are great eons (bskal pa chen po), superior eons (bskal pa mchog), medium eons (bskal pa bar pa) and minor eons (bskal pa chung ngu). The lengths of life of the various beings as given in the Vimalaprabhā (in the commentary to verses 14 and 15 of the first chapter of the tantra) are at their longest at the very top and bottom of world system, and at their shortest – although these are not specified – for those such as humans existing on the surface of Great Jambudvīpa – exactly in the middle. Starting at the top, we have the gods of the formless realm. The lowest of these have a lifespan of one great eon, the next up two great eons, and then three and four. A similar pattern applies to the other levels. The lowest of the sixteen types of gods of the form realm have a lifespan of one medium eon, and this increases to sixteen medium eons for the highest. The first of our paintings describes these as one to eight medium eons followed by nine to sixteen superior eons. This is presumably a mistake as this would make medium and superior eons of the same length. Also, the current painting, although the image is not quite in focus at the top and is difficult to read, appears to give these as numbers of medium eons (bskal 'bring) for all sixteen. The lowest of the six types of gods of the desire realm have a lifespan of one minor eon, and the others two, three, etc., minor eons. The lifespans of humans, animals and ghosts are not specified. Neither is the lifespan of the asuras, but as they dwell in the disk of earth, they should have the same lifespan as the nāgas and the beings in the first hell who are also in the earth disk. This is one minor eon. The lifespan of those in the water disk is a medium eon, those in the fire disk a superior eon, and of the first two hells in the wind disk a great eon. The lifespan of those in the Vajra-hell, which is in the perimeter of the earth disk, is as long as the universe exists. The eight hell, the Vajrārci, is not counted seperately, but included in the seventh. There are several other features in this painting that are worth pointing out. First of all, the main disks of the elements could possibly be described as the primordial elements. 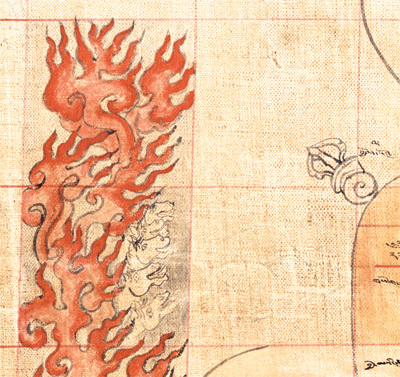 The word "primordial" is rather over-used in Buddhist translations, but in this context, Banda Gelek, for example calls the disks something like this: "original wind" (dang po'i rlung), original fire, and so forth. The inner material of the disk of earth rises up through the surface layer at Vajrāsana. With the other three disks, material rises up to be level with the surface of the disk of earth, although the fire should rise a little higher, and in this painting the wind is seen doing so as well. In the image on the left, the wind can be seen faintly swirling under and around the hand. 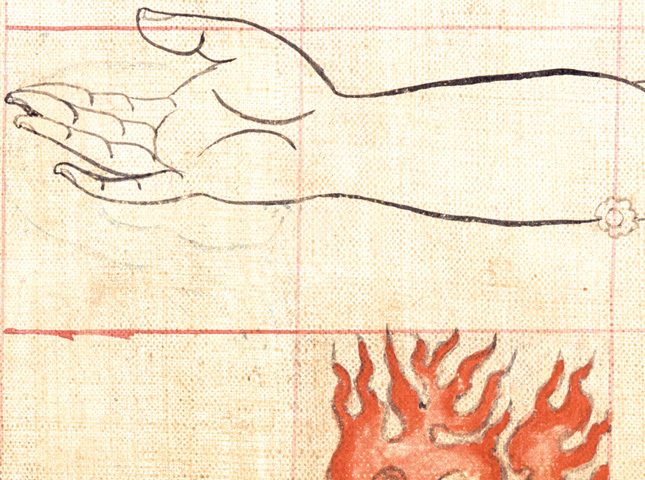 On the right of the image, on the elbow of the human figure is a circular design, almost like a flower. There is another one on the other side of Meru, and these presumably represent the Sun and Moon – they are certainly in almost exactly the right positions. In the image on the right, the fire can be seen rising up a full 50,000 yojanas above the surface of the earth disk. This forms a mountain like ring around Great Jambudvīpa and the salt ocean. In the middle of Great Jambudvīpa are six concentric rings of continents, oceans and mountains. The ring of fire forms the seventh set of mountains. 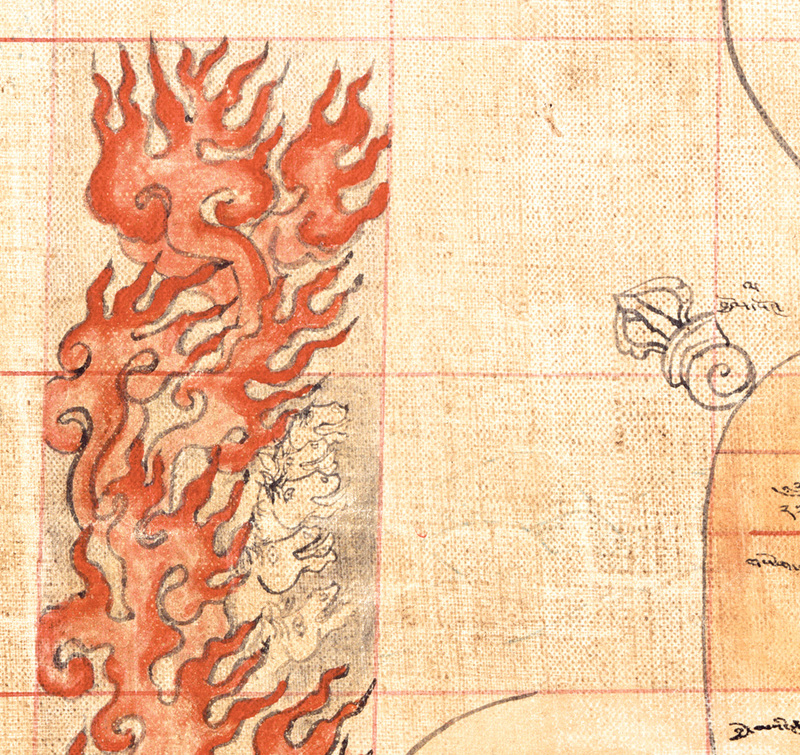 This fire is given a somewhat curious name that is illustrated in the painting: fire from the mare's mouth (rta gdong gi me, vāḍavāgni). This is probably best interpreted as volcanic fire, the energy that comes up from beneath the surface of the earth. The water is very indistinct, but just to the right of the mare heads in the fire one can just make out the wavy form of water. This is water rising up from the disk of primordial water to the level of the surface of Great Jambudvīpa. In the painting this is labelled as the salt ocean. The spaces between the twelve main continents are filled with ocean, and the rivers that flow on these continents (the seventh ring of continents), and all the other minor unspecified islands and minor continents, all flow into the ocean, and from there into this great salt ocean (the seventh) surrounding Great Jambudvīpa. Finally, the image on the left is a detail of Mt. Meru. The main four lines of writing – not at the very top – are showing the positions and the lifespans of the four guardian kings. Below the lowest of these can be seen a series of vertical lines, increasing in height the further from the centre. These represent the six rings of mountains around Meru, that increase in height towards the outside. Last updated 6 April 2010.